In this puzzle game you will have to play something similar to a sudoku. 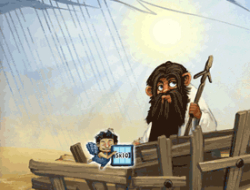 In order to help the Noah build his ark you will have to make sure that the gods are seeing your effort that you are putting into each puzzle board. The way you will help the man build a huge boat is by marking the squares on the play area with tiles but you will not randomly throw them around. There are numbers on the sides and top so you have to be careful that on each row or column there are no more than the numbers they are showing. You can also mark spots with an X if you know you musnt make a tile there. NoNoSparks The Ark 10.00 between 0 and 10 based on 1 votes.